Iraqi National Symphony Orchestra has lost more than half its members since the beginning of the year because they have not been paid. Iraqi National Symphony Orchestra conductor Mohammed Amin Ezzat leads musicians during a rehearsal at Baghdad’s School of Music and Ballet. The ensemble has lost more than half its members since the beginning of the year because they have not been paid. 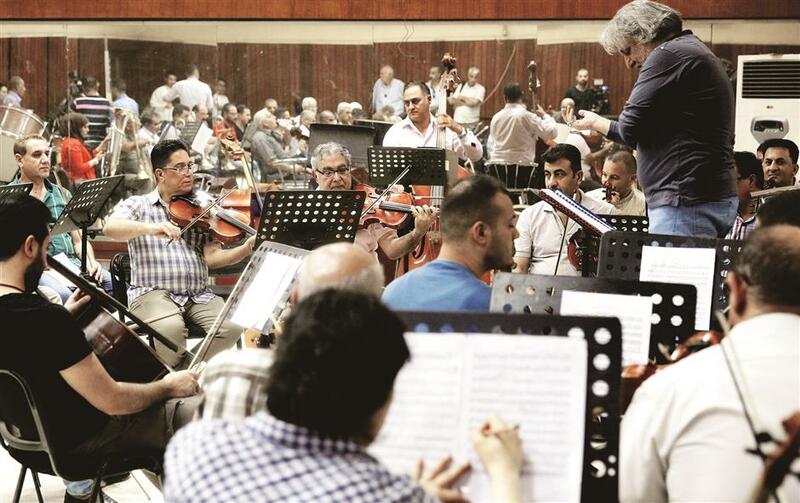 In a dusty Baghdad dance studio, conductor Mohammed Amin Ezzat tries to fire up the musicians of Iraq’s National Symphony Orchestra, whose enthusiasm has been dampened by eight months without pay. The shaggy-haired Ezzat and the 40 musicians surrounding him were gearing up to perform at Baghdad’s National Theatre yesterday, but the group’s morale is at an all-time low. The anti-corruption measure was suggested by the World Bank and should affect only about a third of the orchestra’s musicians, but because of delays in carrying out the reform, wages have been withheld from the entire group. Officially created in 1970 after several unsuccessful attempts, Iraq’s national orchestra has survived decades of upheaval. “Not being paid for eight months has had a terrible psychological effect on the musicians, but we’ll continue to resist peacefully with our music,” said Ezzat, who became the orchestra’s first Iraqi conductor in 1989. When all its salaries are tallied up — including the maestro’s US$1,200 a month, peanuts for a major conductor — the orchestra costs the state about US$85,000 a year. 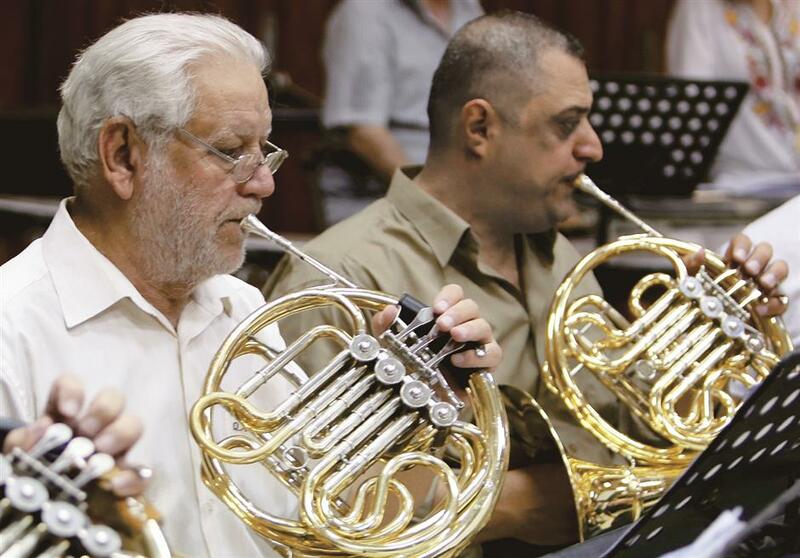 Iraqi National Symphony Orchestra musicians take part in a rehearsal at Baghdad’s School of Music and Ballet. The orchestra often plays in the dark because they have no money to buy fuel for the generator and power outages in the country are frequent. But according to Raed Allawi, the head of administrative affairs at Iraq’s culture ministry, there is no reason to panic — the wages will soon be paid. “The finance ministry has asked for a regularization of contracts. Verification measures are under way and this explains the late payment of wages,” Allawi said. For the symphony’s musicians, however, these are empty words they have heard already. “I’ve been an obstetrician and a flute player since I was very young,” he said. Because of the directive, the 57-year-old practitioner — who teaches at Baghdad’s al-Nahrain University and plays in the national orchestra — is now entitled to only one salary. “In Iraq, we’re proud to have more than one job, to have more than one love, to practice two professions with the same love and passion,” said Dujaily. He plans to continue with the orchestra to help preserve its quality. Further along into the rehearsal, the studio’s electricity cuts, a common occurrence in a country plagued by power outages. The orchestra cannot afford the diesel to fuel the building’s generator. “There have been crises in the past, but this is the worst,” said Doaa Majid al-Azzawi, an oboe player. “Especially since my father and I are musicians. “We don’t know what will happen, but if the orchestra has to stop, it’s culture in Iraq that will be dealt a deadly blow,” the 25-year-old said. When the studio’s lights eventually make a flickering return, so too does the players’ enthusiasm, and the music swells. “As long as we live, music will live. It’s our culture,” said Noor, the conductor’s daughter.